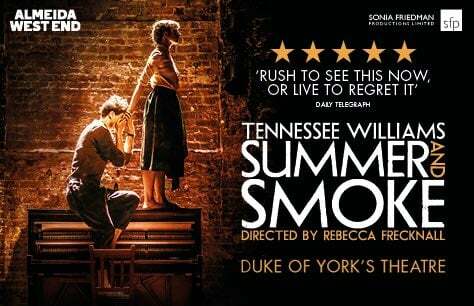 Tennessee Williams’ Summer and Smoke tickets are available now to the London's Duke of York’s Theatre transfer! Following a critically acclaimed sell-out run at the Almeida Theatre Rebecca Frecknall’s Summer and Smoke is transferring to London’s Duke of York’s Theatre. Star Patsy Ferran and the entire cast of the Almeida run are reprising their roles for the Tennessee Williams revival. High strung, refined to a fault Alma begins to questions everything she thought she stood over the course of a Mississippi summer spent with the wild and irreverent Doctor John Buchanan who grew up next door. Running at the Duke of York’s Theatre in London's West End from November 2018 to February 2019, tickets for this production are sure to be in high demand. Do not miss this incredible Tennessee Williams revival! Summer and Smoke tickets are booking now, get your tickets early to avoid disappointment!